Although the municipality of Kempele was founded in 1867, the area has been inhabited since approximately the 16th century. A number of denominations for the Kempele area can be found in early literary sources: Kembele, Kembelä, Kämbele, Kämbelä, Kiembele, Kiembelä and Kiemböle. The origin and meaning of the name Kempele have been fascinating researchers for a long time, as there is no similar name to be found elsewhere in Finland. Jouko Vahtola, Professor of Finnish history at the University of Oulu (Oulujokilaakson historia, "Oulu river valley history", 1991) points out that the old place names in the areas from the coasts of Oulu and Liminka through to Oulujärvi include such names for places of nature that can only be explained to have been given by people speaking the Lappish (Sami) language. Sami people are known to have been hunting for seals in the Oulu region a long time ago. Vahtola thus makes the assumption that the name Kempele may have been derived from the Sami word "gaeppel", referring to a seal's front flipper. Kempele used to be a small hamlet, forming a part of Suur-Liminka. The first record of Kempele as a habitation or village dates back to the church tithe records of 1568. Kempele was entered in the records as consisting of just tree houses. The final break-up with Liminka only took place in 1774, when Kempele received full chapel parish rights. Municipal management was started in 1867. An intensive co-operation with the neighbouring municipalities and the City of Oulu has shaped and determined the development and identity of Kempele to a large extent. The municipalities in the Oulu region and their distances are small. Good traffic connections, the North-South railway, road 4 and the airport next door, together with an active economic and industrial atmosphere, have been attracting lots of families with children and educated young adults to Kempele during the recent few decades. Whereas Kempele had just 1 747 inhabitants in 1940, the total number of inhabitants was over 16 000 in 2013. At the end of last century, Kempele was the fastest growing municipality in Finland. Older Kempele-dwellers have seen the population multiply by nine during their lives. The main attraction of Kempele as a place to live lies in its rural-like milieu next to a city, its versatile and high-quality services and great outdoor recreation opportunities and facilities. Hahtoranta Hahtoranta: Hahto refers to seafare. Kiiesmetsä Kiiesmetsä:The word kiies, denoting a fox hole, derives from eastern Finland dialects. Kokkokangas Kokkokangas: Kokko refers to eagle, Kullio-oja: Kulju can be tracked back to a water-filled hollow or depression, or a large puddle. Köykkyrin- kangas Köykkyrinkangas: Köykky denotes a bent or humped position, which suggests that place name might be derived from what a humped back looks like. It may thus refer to a shape in nature, such as a high-lying spot that looks like a hump. 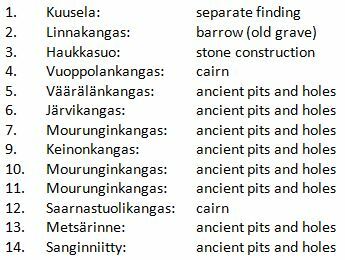 Linnakangas Linnakangas: Linna refers to ruins left by Lappish dwellers in north-eastern parts of muncipality. Thus, from a geographical perspective, this denomination is a little inexact. Monkkasenranta Monkkasenranta: Named after Monkkanen farm. The name Monkkanen derives from the forename Magnus or Maunu. 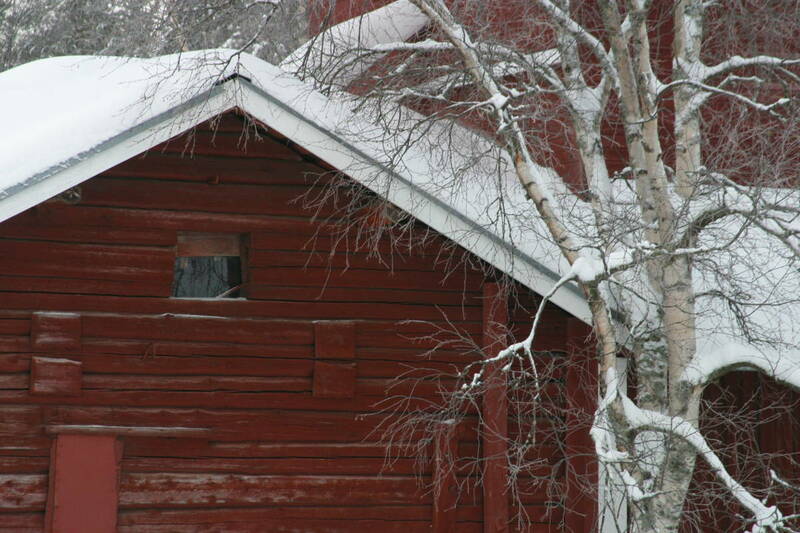 Mourunkijärvi Mourunkijärvi: Mourunki comes from Sami language and it may refer to the sounds made by animal. Murto Murto: The Murto village at the eastern of Kempele shares its name with the Murto village across the muncipality border in Tyrnävä. 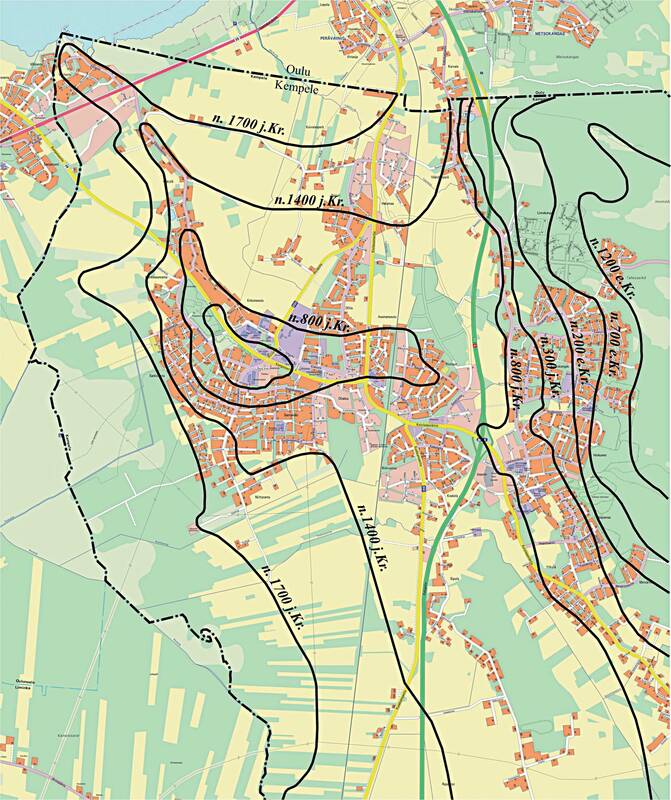 In the land use plan of Kempele muncipality, Murto forms a part of the component area of Ketolanperä. In old Finnish, the word Murto denotes a hard-to-penetrate or rough woody terrain, while it can also be connected with tradiotional slash-and-burn farming. Wood used to be cut down for a murto and once the felled wood dried up, it would be burned and the area would be used for farming. Sarkkiranta Sarkkiranta: The area has been named after the Sarkkinen house, the first recorded main estate of the village, or maybe of the whole of Kempele area. Vihiluoto Vihiluoto: Vihiluoto is a small island just a little of shore. "Vihi" denotes "get wind of sg", which suggests that the island may have been used for keeping a lookout for possible hostile boats or for catch opportunities. The Oulunsalo island used to be separated from Kempele and the mainland by Sokeansalmi, a straight that was two km wide, which gradually closed and turned into dry land due to the land uplift during the 18th century. The land uplift still continues at the rate of about eight mm per year, which causes the shoreline to gradually move further and further to the West. In about 2500, both Liminganlahti and Kempeleenlahti will most probably have turned into dry land. Thanks to the fast progression of land uplift in the Kempele, area relics can still be found in this area. A group of stones that was found and studied in 1983 in Linnakangas serves as an example of such relics findings. The Iron Age finding revealed, e.g., pieces of burnt bone, a copper ring and a Greenland seal skull.